Through three games, the Vikings haven't lived up to the best-in-class standard that the team's defense has established for itself -- and lived up to in 2017. Among the many things the Vikings’ 2017 defense did well, the group’s ability to avoid big plays stood out as one of its best attributes. Equipped with an active pass rush that forced opposing offenses to think quickly and a group of linebackers and defensive backs rarely prone to busted coverages, the Vikings allowed just 41 plays of 20 yards or more in the regular season, the second-fewest in the NFL in 2017. This season, though the Vikings remain among the top half of the league in terms of giving up big plays, they haven’t been anywhere near as crisp as they were a year ago. And through three games where they’ve allowed 65 points (not counting a blocked punt return for a touchdown), big plays have become an issue. The Vikings have allowed 10 plays of 20 yards or more this season, which ties them for 10th-best in the league with seven other teams. That’s still solid, of course, but there’s a difference between solid and the best-in-class standard the Vikings’ defense has established for itself. On Sunday, the Vikings’ issues on big plays cropped up again in a familiar place: miscommunication in their coverage zones. The play before Josh Allen’s 26-yard touchdown throw to Jason Croom, CBS color commentator Tony Romo pointed out how the Vikings were packing their safeties near the line of scrimmage, effectively daring Allen to throw downfield. The Bills responded by faking a screen to Marcus Murphy, which drew nickel cornerback Mike Hughes into the flat. Linebacker Eric Kendricks filled in for Hughes late, and Croom slipped by Kendricks downfield, with safety Andrew Sendejo the only deep man in the middle of the field. Then, on the final play of the first quarter, Allen rolled to his right, and the Bills sent tight end Charles Clay on an underneath route near Kendricks and nickel cornerback Mackensie Alexander. That opened up space in the middle of the field for running back Chris Ivory, who caught an 11-yard throw from Allen at the Bills’ 48 and raced down to the Vikings’ 6. The Vikings turned Jimmy Graham loose for a pair of big plays a week ago in Green Bay, and were burned for long gains to George Kittle and Kyle Juszczyk in Week 1 against San Francisco. With Alexander and Hughes still relatively green at the nickel position, it stands to reason teams will continue to attack the Vikings with underneath throws until they prove they can stop them. –With the Vikings listing Everson Griffen as inactive for the game because of a knee injury (and absent from the sideline because of what Zimmer called a personal matter), the team leaned on third-year man Stephen Weatherly for most of the day at left defensive end. Weatherly, who played 51 of the Vikings’ 67 defensive snaps, had a solid debut, posting his first NFL sack and registering a tackle for loss, as well as two quarterback hits, among his seven tackles. The Vikings gave 22 snaps to Tashawn Bower. Tom Johnson, in his first game back with the Vikings, played 22 snaps as part of the Vikings’ defensive tackle rotation, while second-year man Jaleel Johnson got 12. –Four years ago, Bills defensive end Jerry Hughes gave Matt Kalil a difficult day in Buffalo, posting 1 1/2 sacks in the Bills’ one-point win. On Sunday, it was left tackle Riley Reiff who struggled with Hughes’ speed and crisp angles around the corner. Hughes had two quarterback hits and a sack, stripping the ball from Kirk Cousins after beating Reiff around the edge. The Bills ran a stunt with Hughes and linebacker Matt Milano, and Latavius Murray picked up Milano’s blitz, but Hughes got by Reiff and swatted the ball out of Cousins’ hand. –Cousins also missed Adam Thielen and Stefon Diggs on early throws that might have altered the flow of the game in the Vikings’ favor. He overshot Diggs on a second down on the Vikings’ first drive, a play before the Bills’ first strip sack, and overthrew an open Thielen on a deep crossing route on a third down as the Vikings tried to dig out of a 17-0 hole. 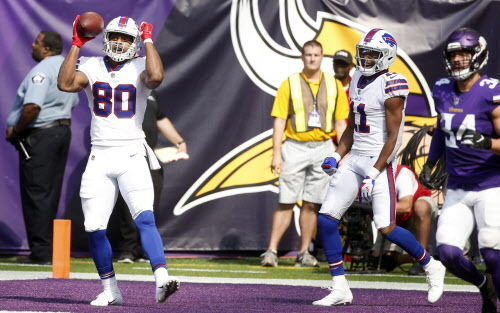 –The Vikings’ average drive started from their own 18 on Sunday, while the Bills started from their own 40. Three of the Bills’ first five drives started in Vikings territory, and another one started from their own 35. All five ended in points. “Obviously, you can’t turn the ball over and give their offense a short field,” Cousins said. “We asked too much of our defense having to be out on the field so much. Very little time of possession for us.” The Vikings held the ball for just 24:15 on Sunday. How did pass rush get to Cousins at the worst time for Vikings?